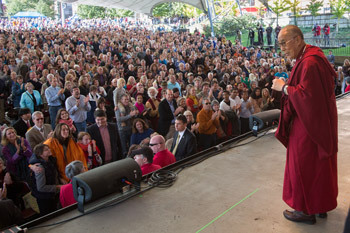 I just posted a new episode of Word Magazine titled The Dalai Lama Comes to Town to sermonaudio.com. The episode includes a dialogue with a young Buddhist I had on the Downtown Mall last Thursday. Sad to say, it has been a year since I last did one of these Word Magazines. No time. Maybe I can get it going again. Here are some links to some things mentioned in the episode: (1) My blog post, What does Lhasa have to do with Jerusalem? ; (2) The biography of the Dalai Lama from his website; (3) info about the Dalai Lama's 2012 visit to Charlottesville from the city's website; (3) Penn and Teller's anti-Dalai Lama youtube clip (warning: content is offensive); and (4) Christopher Hitchen's critique of the Dalai Lama (supposedly this is the article he did on salon.com; the website looks questionable, so digest with ample grains of salt). Note: The latter two sources come from atheists who, I acknowledge, would be just as scornful of Christianity as of Tibetan Buddhism. Still, I think their insights are worth considering, particularly in challenging how secular Westerners often naively embrace exotic causes (including spiritual ones) without perhaps fully understanding their contexts (e.g., Can anyone say, "Koney 2012"? ).